Magnetech opposite pole electromagnets (magnetic pole on each end) can repel a permanent magnet with pole on each end. In order to see repelling effect, magnetic field strength from both an opposite pole electromagnet and a permanent magnet must be comparable to each other. Size the diameter of a permanent magnet as same as the diameter of the pole of an opposite pole electromagnet, not the outer diameter. Make sure the permanent magnet is a disc shape. A permanent magnet in rod shape will not work. Because there is a magnetic field cancellation, adjust the air gap between the electromagnet and permanent magnet so that one of them cannot overcome the other. Usually, the electromagnet has to operate at very low duty cycle or pulsed voltage in order to output strong magnetic field without overheating. Typical permanent magnet sizes are 5/8" diameter x 1/16" thick Neodymium magnet for OP-1212, 1" diameter x 1/8" thick Neodymium magnet for OP-2025, and 1-1/2" diameter x 1/4" thick Neodymium magnet for OP-3030. 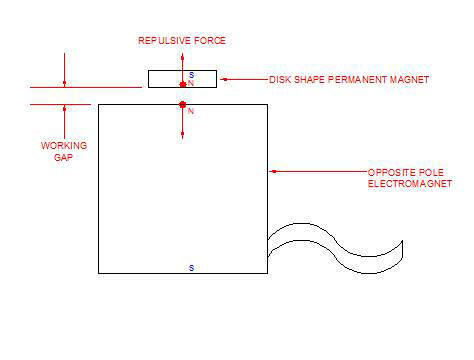 Repelling force depends on the size of permanent magnet, the type and grade of permanent, the gap distance between the permanent and an electromagnet. Due to the variation of permanent magnets, we would not post any repelling force between a permanent magnet and an opposite pole electromagnet. We strongly recommend that you use our standard in-stock opposite pole electromagnets to test and verify your concept first before jumping into custom opposite pole electromagnets. By using an opposite pole electromagnet to repel a permanent magnet, user has freedom to select a permanent magnet to suite the application. However, Magnetech Corp. has developed a line of proprietary design of Push-Pull electromagnets that cover many repulsive applications. Magnetech opposite pole electromagnets (magnetic pole on each end) can repel each other. There has to be a little air gap between the electromagnets in order to repel each other. Usually, the electromagnets have to operate at very low duty cycle or pulsed voltage in order to output strong magnetic field without overheating. We have posted some application data for your reference. When one opposite pole electromagnet repelling another electromagnet or permanent magnet, there is a long air path in the loop of magnetic path. The air path reduces magnetic strength exponentially. Following is the ideal configuration where is no air path at all. So this is a way to get maximum strength of repelling force. It is a proprietary design. This is a defined set of an electromagnets and a cap. The movement of the cap must be restrained only on the axis of the electromagnet. When there is no DC power, the electromagnet holds the cap tight or pulls the cap closer. When applying DC power, the electromagnet repels the cap or push the cap away. See standard and in-stock list of Push-Pull electromagnets.